Today I saw the recording of Disney’s Broadway version of Newsies! Oh my gosh I love it so much!! Now that I have seen both version I will be stating why I love the Broadway version better. Jeremy Jordan v. Baby Bale- Jeremy Jordan will always win in my book. He is the superior singer (oh my gosh is he a belter and it’s fabulous) and his New York accent is over the top and great. Choreography- Sorry Kenny Ortega but the modified ballet, tap, and flips and tricks far surpass the awkward dance numbers of the cult classic. Katherine Plumber!- Ok this woman is fantastic. She’s Jack Kelly’s love interest and doesn’t exist in the original movie version. She’s funny, smart, and sassy and I love her. She’s a woman who’s pursuing her passion (writing) and succeeding. The pseud0/Mary Sue love interest she replaces could honestly have been played by a cardboard cutout in the movie and no one would have noticed. 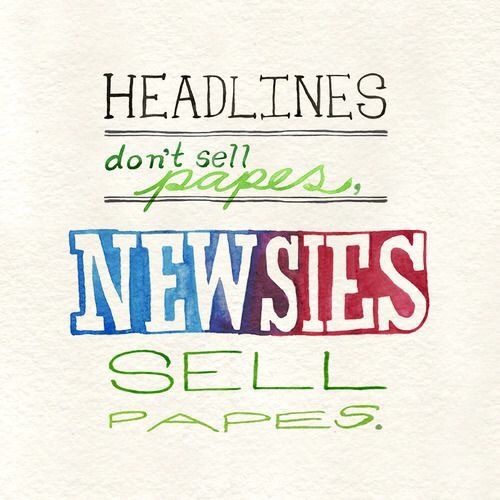 I’m sure there are many more reasons in favor of Newsies. I hope you had a chance to see Newsies and if you did comment your favorite song(s)! Mine are Carrying the Banner, King of New York, and Watch What Happens!